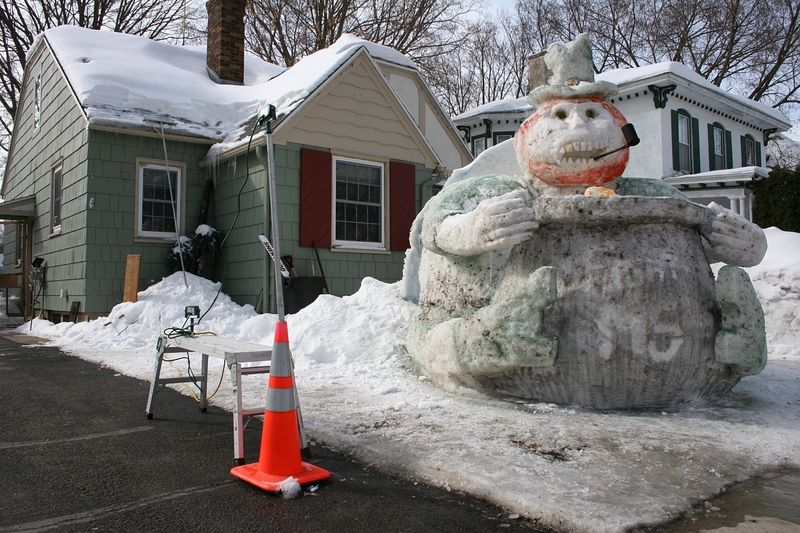 IF KURT KLETT CAN CONVINCE city councilors, my community could host an annual snow carving competition in Central Park. 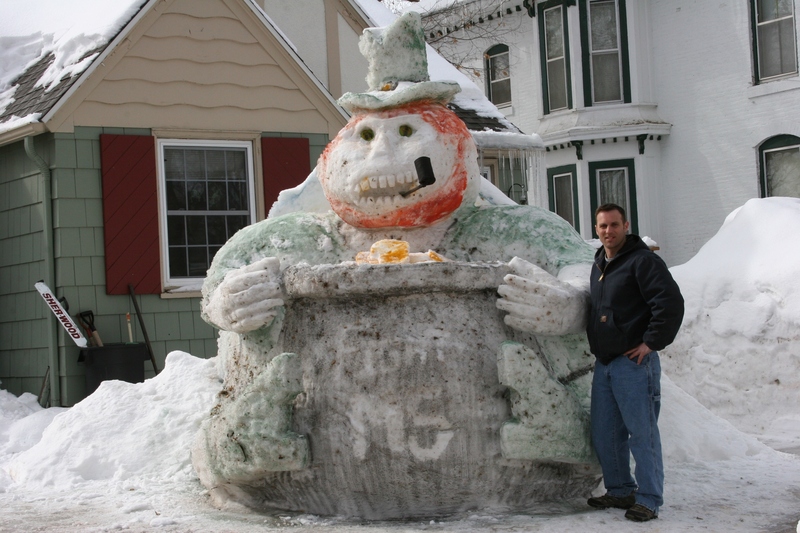 Faribault resident Kurt Klett and his latest snow sculpture, a leprechaun with a pot of gold. Warm temps had partially melted the snow, fading the colors, when I photographed the art late Sunday morning. That’s the plan, according to this 42-year-old Faribault resident who, for the past five winters, has created snow sculptures in his front yard and this year also entered the St. Paul Winter Carnival snow sculpting contest. Given Klett’s enthusiasm and talent and the admiration of locals, his idea certainly could fly. I absolutely support his proposal as a way to bring visitors into Faribault, add a fun, diversionary aspect to an oftentimes long Minnesota winter and promote awareness of Multiple Sclerosis. Entry fees for the proposed snow sculpting contest would go toward MS, says Klett, diagnosed with the disease of the central nervous system in 1999. The single father of three, ages 6 – 13, suffers from vision and other issues and is currently on disability. He once worked in construction and sales and now works at the Shattuck-St. Mary’s School hockey arena. His body embraces cold temperatures, Klett says, so he needs to take care not to become overheated while sculpting. Klett’s first sculpture of this winter, photographed in late February. 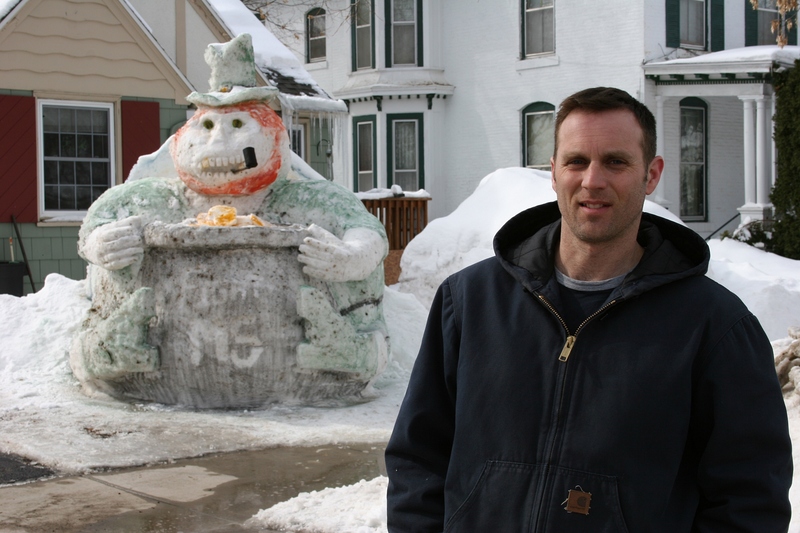 This winter he’s already crafted two snow sculptures in Faribault. The first, a duck, stood completed until two days of 40-degree temps caused the beak to partially fall off. Klett showed me these photos he took of the two sculptures with especially vibrant colors before temps warmed. Undaunted, Klett and a neighbor then “sawed” the remainder of the beak off with a 10-foot chain so he could reshape the duck into a leprechaun holding a pot of gold. As I’ve observed and as Klett notes, his sculptures are constantly changing, just like the effects of MS. His art, he says, is an ode to MS, a way to raise awareness of the disease. FIGHT MS is barely visible now on the pot of gold after warm temps began melting the sculpture. FIGHT MS marks the front of the leprechaun’s pot of gold. Klett carved a bull for the St. Paul Winter Carnival snow sculpting contest, dubbing the bull as “Bully the MS Goalie.” Last year he created a stop sign with hockey sticks in his yard, honoring Minnesota Wild goalie Josh Harding who also has MS. The leprechaun’s pipe is crafted from a crowbar and a raisin container wrapped in hockey tape. This sculpture reaches 12 feet to the top of the hat. 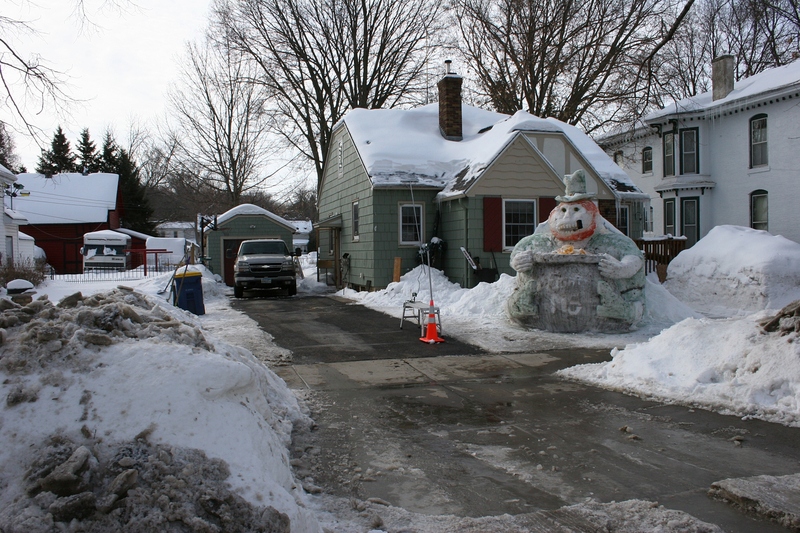 What he crafts from the snow gathered into a huge mound from his and sometimes a neighbor’s yards and even from the roof of his house at 417 Second St. N.W. “depends on what the pile looks like,” this sculptor says. He’s previously also created a leprechaun on a shamrock, a komodo dragon surrounded by a skyscraper with two hearts, and a T-Rex. Sometimes his kids help choose the art. 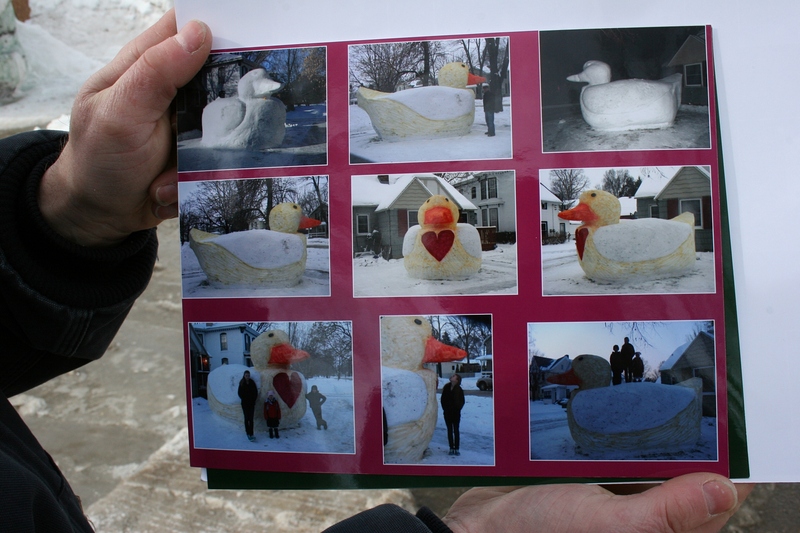 A photo montage by Klett of his 10-foot high duck sculpture. 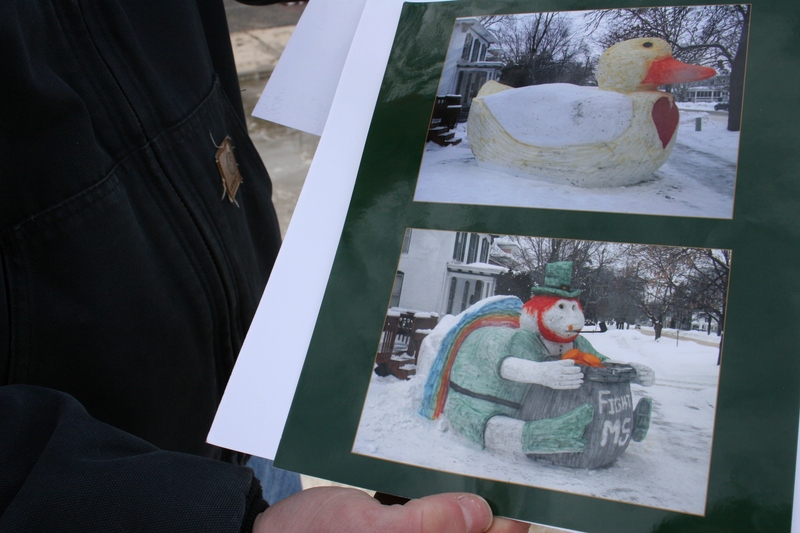 The process of sculpting this year’s duck and leprechaun took him 14-16 hours each. 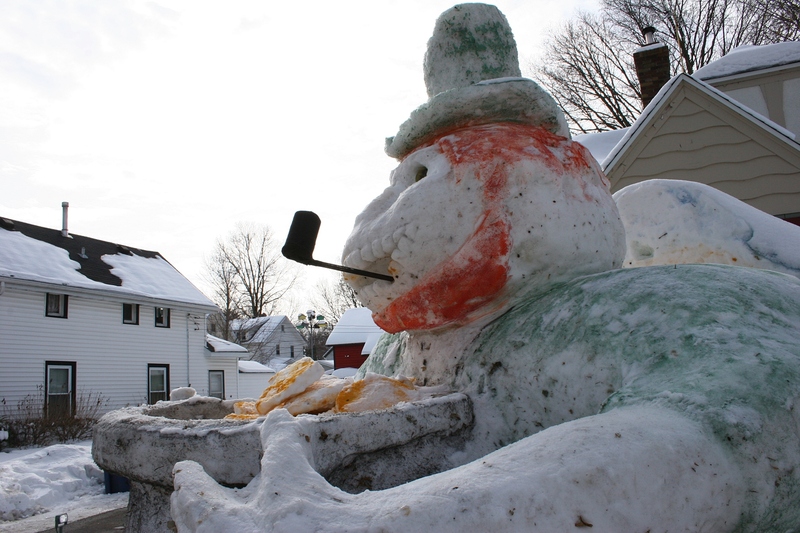 Depending on the weather, the leprechaun may eventually evolve into a third sculpture. Already warm temps are eroding his leprechaun, fading the colors. The artist shines a spotlight,left, on his sculptures. I agree. 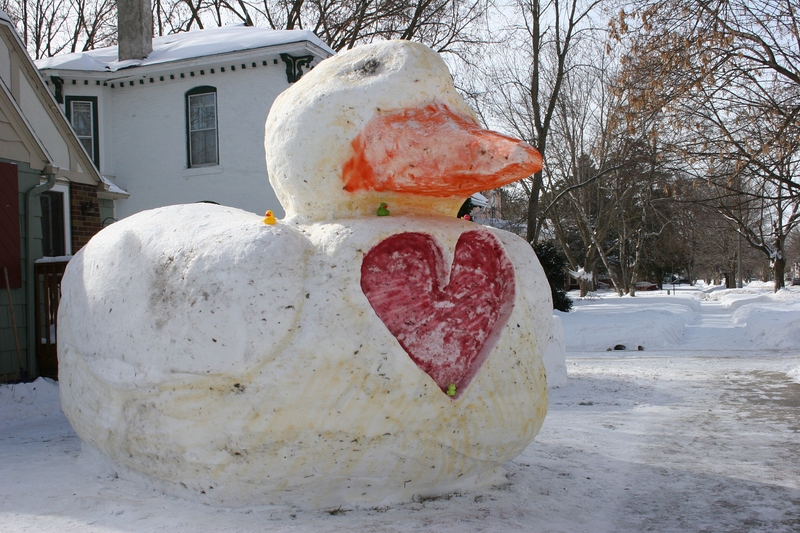 Now imagine Central Park in Faribault graced next winter with such remarkable and beautiful snow art. FYI: Kurt Klett has not yet approached the Faribault City Council with his request for a snow sculpture contest in Central Park. He is currently raising awareness and gathering support for this project.